For quality heating and air conditioning service in Grove City, OH that you can trust, call Quality Air Heating and Air Conditioning. We have years of experience working with countless homeowners and business owners to bring them comprehensive HVAC service for many different types and brands of systems. If you need new installation, our specialists can recommend a make and model of unit that fits in your budget and matches your home’s needs. We also provide 24/7 emergency heating and air conditioning repair in Grove City, OH, so call us anytime. Don’t wait for the heating system in your home to completely stop working for you to call for heating system service in Grove City, OH. At the first sign of trouble, contact Quality Air Heating and Air Conditioning and one of our friendly technicians can help you with any service that you need. If you need heating installation, we’ll talk with you about the entire process and help you find a new system for your home. If your heater is blowing cool air or if it is making any new noises, call us 24/7 for heating repair in Grove City, OH. Your heating system probably gets a lot of use throughout the winter, keeping your home nice and comfortable. The winter is a common time for problems to arise because of all the extra use that your heater gets. For high quality heating repair in Grove City, OH call Quality Air Heating and Air Conditioning. We can work on a large range of systems including heat pumps, furnaces of all types, ductless mini split heating systems, geothermal units and more. If something happens after hours, we have you covered with our 24/7 heating repair in Grove City, OH. Don’t risk your home’s comfort and efficiency by having a non-professional install your new heating system. There are too many components that need calibrating and connecting; something is bound to go wrong. Quality Air Heating and Air Conditioning offers heating installation in Grove City, OH and we will make sure that you get the perfect sized heater in your home and that it is installed quickly and properly. Call today to talk with one of our friendly Grove City, OH heating installation experts. Does your air conditioning system make an annoying noise when it operates? Are you ready to have a new AC system installed? Quality Air Heating and Air Conditioning offers comprehensive air conditioning service in Grove City, OH for all types of systems. We can install any kind of new system in your home and we can also repair all types of problems. We offer 24/7 emergency air conditioning repair in Grove City, OH which means that you can call us anytime. Even if you take great care of your air conditioning system, it will eventually break down and require repair. Fortunately, Quality Air Heating and Air Conditioning offers total air conditioning repair in Grove City, OH for all types and brands of system. Whether you have a central AC unit, a heat pump, ductless mini split system, geothermal system, or any other type, give us a call. We know how important your air conditioner is to your home’s comfort, which is why we’re available 24/7 for emergency air conditioning repair in Grove City, OH. Starting your new air conditioning system out on the right foot is absolutely critical to it lasting a long time and delivering consistent and efficient cooling. Quality Air Heating and Air Conditioning is dedicated to delivering quality air conditioning installation in Grove City, OH for any kind of system that you want. If you’re not sure which type is right for you, just let one of our technicians talk with you and then make a recommendation based on your budget, home size and energy usage goals. Call today to find out more. Most homeowners want their air conditioning system to operate as effectively as possible and to last for a long time. But you simply can’t expect that unless you get your system maintained on a regular basis. Quality Air Heating and Air Conditioning provides outstanding air conditioning maintenance in Grove City, OH. Our program offers our members regular tune-ups, reduced pricing, extended warranties and much more. Also, regular maintenance could reduce the need for repair, and increase the efficiency of your system as well. In Need of an AC Replacement? Don’t let an aging and failing air conditioning system hinder your comfort. Replacing your AC even if it is still operating could have several tremendous benefits for your home’s efficiency and comfort. Quality Air Heating and Air Conditioning offers total air conditioning replacement in Grove City, OH and we can help you figure out which type of AC system you want installed in your home. Call us today if your AC is getting old or if it has started to require more frequent repair. Businesses are under a lot of pressure to keep their interiors comfortable for their customers, clients and employees no matter what the temperature is outside. That’s why we here at Quality Air Heating and Air Conditioning are proud to offer our commercial customers total commercial HVAC service in Grove City, OH. We can help you install a new system if yours has stopped performing well and we also offer complete commercial HVAC repair in Grove City, OH for all types of systems. Call us today and we can also set you up with regular maintenance for your system which could reduce its need for repair and increase its efficiency. Does your heating and air conditioning system make any unusual noises when it operates? Are you not getting enough heating or cooling in your business? 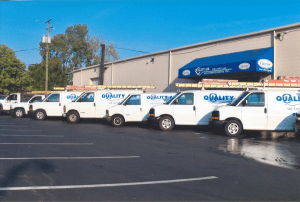 Quality Air Heating and Air Conditioning offers complete commercial HVAC repair in Grove City, OH and we’re available 24/7 in case your system breaks down after hours and you need someone immediately. Our technicians are highly trained and can fix any problem that you might have quickly and with the high level of quality that our customers have come to expect from us. Starting a new business can be hard to do and the last thing you want is your HVAC system to break down after you open. Getting professional commercial HVAC installation in Grove City, OH is a great way to start your new HVAC equipment off on the right foot. Bad installation is a common cause of problems so call Quality Air Heating and Air Conditioning if you need commercial HVAC installation in Grove City, OH and we can talk with you about which type of unit you need and which size as well. Don’t let your HVAC system fall into disrepair because of lack of maintenance. Quality Air Heating and Air Conditioning provides quality commercial HVAC maintenance in Grove City, OH which could reduce repair, increase the efficiency of your business and also extend your heating and air conditioning systems’ operating life. Our maintenance members also get better pricing, priority service over non-members, as well as extended warranties and more. Call today to learn more. Heat pumps provide both heating and cooling, which means that they get a lot of use throughout the year. This can cause the need for service, and if your system isn’t operating properly call Quality Air Heating and Air Conditioning for heat pump repair in Grove City, OH. If you’re interested in having a new heat pump installed in your home, we can help with that as well. We will make sure that your heat pump is the right size, that it is installed safely and that it operates as the manufacturer intended. If you want your furnace to work well, you need to have all your services performed by a professional. Quality Air Heating and Air Conditioning is dedicated to delivering quality furnace service in Grove City, OH for all types of units including electric, gas, and propane models. If your furnace is making any new noises or if it isn’t producing enough heating, call us for 24/7 furnace repair in Grove City, OH. We would love to help you stay nice and toasty in your home during the winter so call us today.